Whether you’re planning a trip to Florence or just looking around at what to see, you will very soon run into the name “Medici”. You’ll find phrases that indicate “the Medici did this” or “the Medici did that” or run into palaces that carry the Medici name. You’ll very quickly realize the Medici was an important family in Florence but it wasn’t any family: it was the Medici that made Florence what it is even today. That is not much of an overstatement, either. While I have been living in Florence for years and know how important the Medici was to Florence, I still cannot get most of the clan straight in my head. So when we were recently invited to go to see the new “Medici Dynasty Show“, I was quite excited at the idea of seeing what it was all about. Since I know everyone who visits Florence runs into the Medici crest (with six round balls) all over the city and hears over and over the family name without fully understanding how everything is connected, I was hoping the show could help even me make better sense of the family and it’s history – and it does that and more! 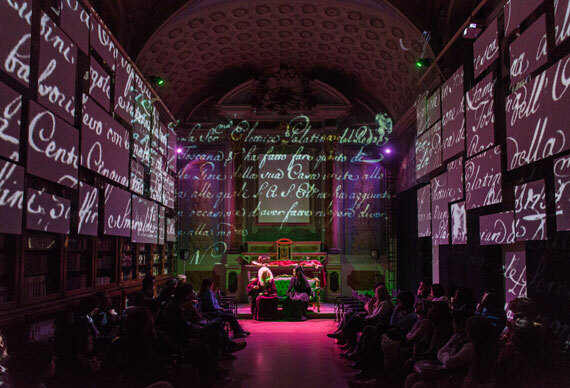 The show, which started its run this past April, will be celebrating its 100th performance tomorrow tonight and celebrating with special light show in Piazza San Lorenzo. Head there around 8pm to see it, seeing the Medici Dynasty show before at 7pm. 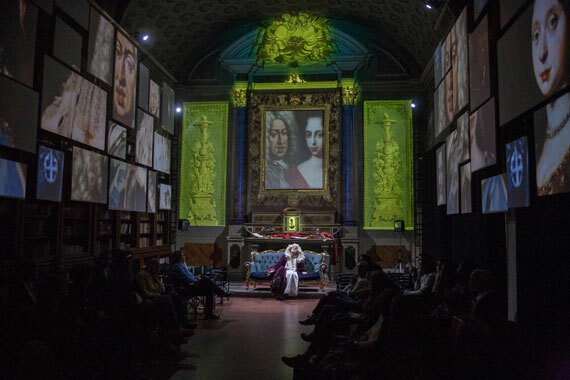 The Medici Dynasty Show itself is a live theatrical performance that runs 5 days a week within the San Giovannino dei Padri Scolopi Library right across from the Basilica of San Lorenzo. It is a great location given this is in the heart of what was the Medici clan’s neighborhood in Florence. 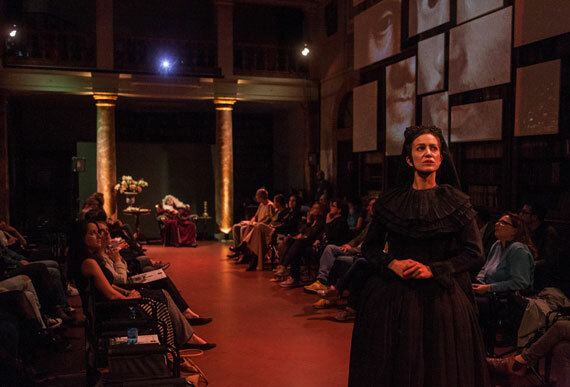 We saw the superb actors, Carolina Gamini and Tim Daish, in the roles of Anna Maria Luisa and Gian Gastone of Medici, the last two siblings of the Medici clan. Unable to produce any heirs and finally admitting that the family dynasty would die with their deaths, the show is based on their secret meeting just two weeks before Gian Gastone dies in 1737. Anna Maria Luisa convinces Gian Gastone to do the right thing: make sure that the family’s incredible wealth and fortune does not leave Florence. They had already seen the great collections of treasures of other families in Ferrara, Padova and elsewhere taken to pieces, sold off and spread across the world. They didn’t want that, they wanted them to stay in Florence so that the legacy of the Medici would not be forgotten. Anna Maria Luisa managed to do this with the Family Pact that was signed a few months after Gian Gastone’s death. The pact has a list of the treasures that were bound to Florence: the two go through them, back and forth across the centuries, making us realize how much Florence owes to the Medici family’s power, their appreciation for the arts and humanities and sponsorship of works that have become some of humankind’s greatest masterpieces of all time. The last of the Medicis certainly accomplished their goal. Can you imagine Florence without Michelangelo’s New Sacristy at San Lorenzo or without Botticelli’s Birth of Venus or Primavera at the Uffizi Gallery? Without the David? Without the many statues and treasures within the Bargello, the Pitti Palace, the Uffizi and Accademia? The Medici Chapels are the final resting place for members of the family: even that mausoleum would not have been built in such a grand manner had their descendants not seen to commissioning the work from great architects and artists. 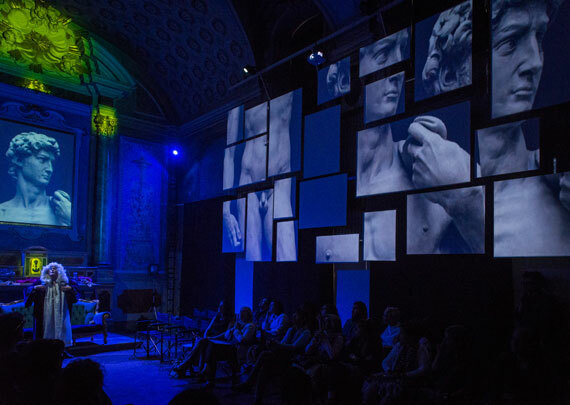 The Medici Dynasty Show is a theatrical performance, making use of video and music to highlight the works of art or locations the two siblings are discussing during their meeting. It honors the memory of this important family to Florence, as well as the artistic, scientific and cultural contributions the family ended up giving to the world back then as well as today, when you consider how their influence and power created works which in turn have inspired generations across the whole world. I particularly enjoyed how the superb acting brought the last two members of the family alive, making their weaknesses all too apparent but also making you realize that despite the great family name, they were simply humans like us and had many problems associated to their times and to the weight their family name carried. Gian Gastone was particularly bitter toward his sister for helping their father marry him off to an ugly wife! I enjoyed the show very much, so I would recommend others go see it. It lasts an hour and is completely in English! The author of the show, Beppe (as Giuseppe Arone introduced himself), says their main goal is to reach visitors and students alike that have just arrived in Florence, offering this as introduction to who the Medici family were and what they meant to Florence, to how important they were to what we see today in Florence. I believe they certainly accomplish that! 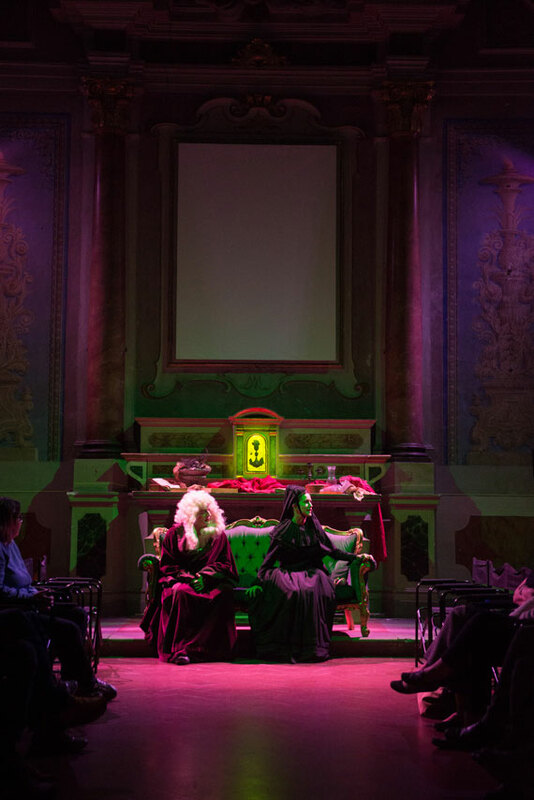 The show runs daily at 7pm from Wednesday to Sunday at San Giovannino dei Padri Scolopi Library (in piazza San Lorenzo, 6). Cost: Full €29, students (to age 25) €20, children under 12 are free, there are family tickets available.